When it comes to making money online there is one method that outperforms all others. This method remains #1 year in and year out, and has for as long as people have tried to make a living on the Internet. The principles that make this method successful are as old as time and as new as today’s most recent trend. This method is what every top marketer uses to stay at the top and what beginning marketers must use to get to the top. The simple (but highly effective) idea that you publish high quality helpful content first and then make sales after people get to know you, like you and trust you. It’s how I have built my businesses and how countless online businesses have been build for over 20 years. Now here’s an important question for you. What if you could create your own content marketing business — easily and ethically — and did not have to create the content yourself? If that sounds good keep reading. Today there is very good news for you. It’s easier than ever to use content marketing to your advantage! That’s because of a little thing called curation. I’m going to share with you what curation is and how you can use it to build your own online empire. This is the first of an multi-part series on how to use curation to build a real online business. When I announced this series yesterday one fellow wrote in to ask what I was selling. No disrespect to him but that’s not what’s happening here. I have nothing to sell – I just want you to have this common sense information. Curation is not a new concept. In fact, it’s quite old. People have been “curating” (or gathering) things together for literally thousands of years. A library is a curation of sorts. So is a museum. So is the Drudge Report. The funny thing about curation is that you see it used every day but you might not be using it … yet. I believe you will want to start using it right away and believe too that curation might be the missing link in your online success. Let’s look at the formal definition. The word “curation” means “to curate”. So let’s look at what that word means. Curate v. select, organize, and look after the items in a collection or exhibition: “both exhibitions are curated by the Centre’s director”. curation n. late 19th century: back-formation from CURATOR. Oxford Dictionaries (2010-10-19). Oxford Dictionary of English, 2nd Edition (Kindle Locations 168775-168778). Oxford University Press – A. Kindle Edition. 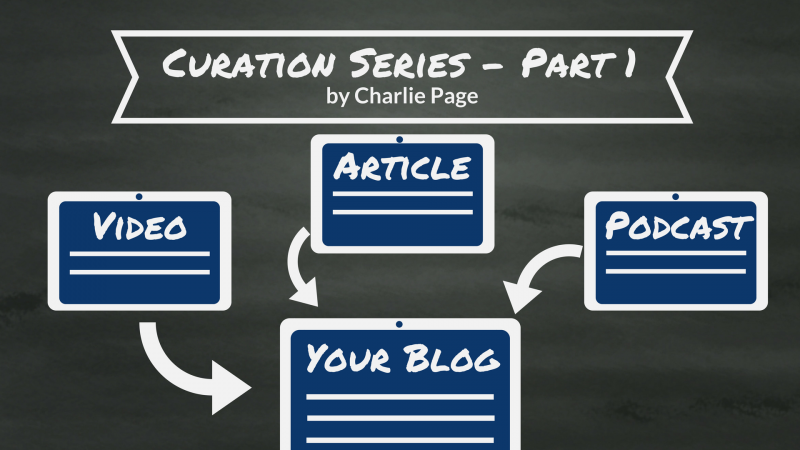 So curation is the process of gathering together content that other people created. That’s important so please remember that one – they create, you curate. The great thing about curation is that it’s a clean and ethical business. To be clear, you will be giving full credit to the person who created the content. No trolling EzineAticles.com and taking article content without linking back to EA or giving the author credit. NOTE: I’m not saying YOU would do that but I am saying that many people do that. I know all too well. They do it to me all the time. In fact, you will find that the more you pay respect to the content creator the more your audience will love you! And the faster your business will grow. More on the “how to” a little later. Today we are looking at the big picture. One great thing about content marketing is that it takes the pressure off. With content marketing you create or curate great content and your work is done. Your readers will do the rest. Please notice that progression because it’s the basis of doing business online. Know leads to like which leads to trust which leads to join (action) which leads to buy (another action). Another reason to use curation is that it’s easy. With curation you can follow you passions and make money from what you love! Much more about that in another article. I’ve an entire article coming about choosing what to curate and how to know if that will be profitable before you spend too much time. What does curation look like? Funny enough, the best way to think about curation is the one that might have sprung to mind … a museum. The curator of the museum does not create the art or artifacts. He or she does not own the art or artifacts in most cases. But what the curator does is vital — they assemble art or artifacts into meaningful collections and offer those collections to the public for a fee. What a wonderful way to make money. And one you can begin using immediately. To be clear, you will not be charging a fee like a museum does. You will be earning money from the strong relationship you will build with those who visit your site; and especially those who join your mailing list. Just look at what Matt Drudge has done. He does not report the news as much as curate the news. While he does “go on location” from time to time, most of his work is done from a laptop wherever he chooses to work. A master at writing provocative headlines, he assembles stories his audience wants and provides links galore. And according to Wikipedia he makes millions doing it. Don’t worry – I will show you all the steps as we go along. And I will share many more examples of websites that are curation success stories. You now know what curation is. And you know that people are making their fortunes with this concept. You should know too that this is something that is easy to do once you know how. And you know that I’m going to show you exactly how I do it … right here in this free series. That’s enough to know for today. Next I’m going to give you an assignment. It’s going to take about an hour, and you can do it anywhere and anytime you want. If you do the assignment you will have taken the first step toward your own online information business. And I can tell you firsthand that sharing information, and helping people, is a beautiful thing indeed! Hi Charlie. I too would like to send my heartfelt belated sympathy for your loss. I pray you and your family are well and life is still a grand adventure for you all. I do not know if you will remember me from my emails of late but I am the driveallnightguy. I apologize for the harsh way I have portrayed my ignorance of online marketing. Because of your personal way of approaching my questions and my dire need of direction with Curation Partners, I am now more fired up about Curation Power! This teaching series on the subject is fantastic and invaluable to my adventure with you and our “Partnership”. Thank you! Great article that nail the concept of curation very well. I have bought almost all Charlie’s Membership, and I can tell you up front this is the best investment I have made online. English is not my first language, another big reason why I love curation since I am target English speaking market. Challenging, though. It is fun indeed. Thank you Charlie for another great piece of valuable content. Abundance of blessings to you and your family! Thank you Jean. It’s a pleasure to work with you! Excellent information as always Charlie. I’ve been on your list for quite awhile now and I always appreciate your information and insight into different Internet marketing topics. Curation has been an area I’ve been trying to get into on my Blog and I look forward to your help with the information you’ll be providing. Thank you. Thanks Bob. I love curation and am really enjoying teaching it deeply at Curation Power. Appreciate your comment. Hi Charlie, So sorry to hear of your father’s passing. Though it was a few months ago now, I know the hurt will still be there. Stay strong. Congratlulations on the launching of Curation. I have no doubt it will a great success as are all your businesses. Thanks, Charlie for your usual unalloyed clarity and clarifications. Trouble is, I am getting to be here two years late – you wrote this article in 2012! Are you reviving this curation concept so that newbies could just read and learn or you are really conducting the curation series along with the assignments? Don’t let the dates worry you – curation works now better than ever! It’s the foundation of many successful online businesses. I have a complete course about curation called Curation Power. Each video has both audio and transcripts so members can choose how they consume the content. You are not too late! Begin curating today and build a strong business online. Great and very useful articl, for somebody like me, knowing nothing about curation, yet… 😉 I’m excited to read more. I know not everyone can get Curation Power, even at the grand opening reduced price, so wanted to make this available again now. Although my comment didn’t include any link, but you didn’t accept my thoughts about my personal experience about how I dealt with content curation. That means that you want only to expose thoughts that goes with your point of view and your marketing direction, nothing else. Well,by this type of your way of thinking, I no more interested to stay in your list, nor to think of any of your products. Not correct. My father in law passed away and so comments are being approved, and commented on, more slowly than usual. I say this as respectfully as I can – if you are upset about that then I won’t regret you leaving my list and not buying my products. You clearly don’t know anything about me yet. I’ve been in country since last Sept, where there is no internet access, but it looks like I made it back just in time! I’ve followed you for a long time, since you offered lifetime DOE memberships a few years back. I’ve not done much with my membership, but that will all change now. Thanks for all you do for us, Charlie. I’m sure that most of us truly appreciate you. I know I do and, to prove it, I will succeed with your training. BTW, I send my belated condolences to you and your family for the loss of your father-in-law. I know, first-hand, how difficult that can be. Welcome back. Thank you for your service and for your mention of my father in law. Really miss him but know he is in a much better place and we will see him again, and for eternity. I had created my own plugin for the purpose of content curation, although there are some in the market but I wanted something simpler, and can give me the choice to do the curation manually or automatically base on any keyword I chose. Good for you. Creating a plugin is more work than most can do. I hope it works well for you. Hi Charlie thanks for sharing this valuable Content. I am now an avid reader of your blog. Really good information and much appreciated. Thanks, Charlie. I lapsed, what was the assignment on this first lesson?? The assignment is in the next article. You can view that here. I’m loving it already, waiting the next lesson..
I’ve got to say though, you are one helluva salesman! Wow – bragging was not what I was going for. Please notice I said “next”, as in the next article. It is on the site now. Feel free to read it here. As usual, another great article full of useful information. Having seen a number of sites that use this principle I can see how it works. looking forward to your next article and learning how to do things properly. Thanks again for always providing valuable, and useful, articles. Enjoyed your article & looking forward to rest of the series. I like the concept & thank you for putting this together. Thanks for taking the time and trouble to give out this useful information. I look forward to hearing more. Thanks Charlie. I have used other peoples articles in the past and never minded giving credit. Finding good articles that are not stuffed with links or run through a spinner has been my problem. I hope to see you address this in the future. I remember having a brief conversation with you Charlie, several months ago about content curation and you had mentioned then that you were planning this series, I’ve been anxiously awaiting it’s arrival knowing that you would deliver an honest and open discussion and evaluation on the use of curation. There does seem to be two camps on whether or not it works and whether or not it is even ethical. Personally, I agree with you and other experts on the subject that one of the main keys, if not the main one is properly crediting sources. I am looking forward to each and every installment of your series and say thanks for the effort and time to share your take on it with us. Thanks so much for this Charlie, I’ve said it before and I’ll say it again you’ve been the best mentor and program owner I’ve ever dealt with. I’m really excited to learn more! Thanks Charlie…..looking forward to part 2! Thank you for this series Charlie. I’ve been wondering about curation for some time and you have made clear exactly what it is. I’m looking forward to the next installment. Really appreciate this. Thank you for this timely series. I have been spinning my wheels with useless one and to page sites. My current site sticks this curation idea. It is currently about 25 pages and I know it will hit double or triple that using this curation approach. This is great timing. I am just starting to use curation to revive an old blog that has been profitable in the past but has lost its way. The original aim of the blog was to seek out relevant information so that my readers didn’t have to. Where it fell down was trying to constantly write unique content based on what I had found. I always resisted the idea of using other peoples content but now I realise that curation achieves my goal and if done in the right way provides a valuable resource. I’m going to suggest that you keep writing YOUR UNIQUE PERSPECTIVE – YOUR SPIN on things while using other people’s content as a basis for your work. When you boil it all down, there really are only a few subjects that most people continue to line up for: heath, relationships and finances. As an example, I was a private music teacher for over 40 years. I taught the classics along with the latest tunes. You know what I noticed about those songs; THEY ALL HAD NOTES – the same basic music vocabulary, just rearranged in a unique and personal way. And even when I taught my students to play the Masters such as Bach, Beethoven and Mozart – I told each one of those students that NO ONE would EVER play ANY piece exactly the same way (s)he did! I guess what Charlie is sharing with us here is that it’s YOUR collection that you are curating; and the way YOU present it/ offer it to your visitors is what will create the bond. You definitely do NOT have to reinvent the wheel with all new content. Give credit where credit is due AND put your own spin on it. Thanks for such a clear definition…I have not really understood the real meaning of curation. Thanks Charlie. Fantastic piece of work charly! I’ve heard a lot about video and article curation lately and it sounds really interesting. However selecting and publishing the right content is a task by its own right. Not to be thought easy, since you have to know your audience to produce the desired results… Anyway thanks for sharing and Im looking forward to the next article. Didn’t work 🙁 never mind, Great article Charlie. I understand the desire to skip ahead but taking these little lessons step-by-step will be helpful to most. That’s why I”m doing it this way. Good guess though! overwhelmed with ALL THAT MATERIAL they have to go through. shelf, never to be opened again. Now I’m just starting out so I don’t have hard facts/figures yet that I can offer you. However, I’m betting the farm that the people who stay with me will stay BECAUSE I respect them enough NOT to deliver my content all at once so they can just race through it or get overwhelmed. I learned from you that it is better to deliver VALUE! I think the quiz/drip method will help deliver that value to my subscribers. Thanks for all you do Charlie! I’ll keep you posted on my results. Great feedback Russ, as always. You have long been one of the most open and willing to share individuals I’ve ever met. I visited your site and can see that you are putting the things you have learned into practice. Your squeeze page looks great and I’m sure your membership is helping people overcome some very real challenges. I’m proud of you and your progress. I also heard about content marketing and curation strategy recently. It seems this is going to be the next hot topic. Power Blogging, i.e. post 2-3 blog articles everyday so that your blog become interested to most readers. While most marketers understand the importance and concept of power blogging and content marketing, only few marketers are doing this. Imagine you need to post 2-3 blog articles EVERYDAY, while I feel difficult even I just post 1 article per day. So, Curation could be the next strategy to build your blog content without writing your own articles, just collect and give some your own comments & credits to the authors. Your readers will appreciate to what you have done as they don’t have to surf and research. Although I have such concept in mind, I still have no idea on how to do it correctly. Charlie, I’m waiting for your next post! Great information I’m looking forward to more. I believe that curation is one of the best way to go and I’m doing it! Looking forward to the next installment! Thanks, Charlie! I know your content is going to make it very clear and to the point so I am looking forward to it, – My daughter started a few weeks ago on one of her beauty blogs so it’s going to be very timely. It is a great idea to monetize the curation! It is my habit to keep those useful info. from online for my future reference. Writing is not my passion but reading and sharing is. Hence I am looking forward to your curation series. Thanks Charlie! Great post, I agree content curation is a key strategy that I have implemented and as a result my traffic and list has really begun to grow! I’m really glad to see you do this series – It is a way to provide much more value to our market than we might be able to create ourselves. As always we can expect a great read and and education from Charlie Page. I’m wondering if you would consider the newspapers people put together on paper.li as curated content. Seems so! It is curated to some degree but most newspapers have staff writers and editors that contribute direct content. As with many information businesses newspapers and magazines are a combination of creation and curation. Good question! Charlie, as always, I’m looking forward to the information you publish. You’re truly a great curator – concerned about pulling together useful information that’s carefully chosen to be relevant to your audience. Much of which I’ve happily paid for. Your initial story about the question of what are you selling – however – sparked an additional comment. And I felt here’s a good spot to air it. On my website Your Healthy Home Biz, I provide an excellent, well-researched report for free and lots of excellent free articles. All well-researched and actionable. I just recently got an unsubscribe message from someone who was offended by me making a sales offer right after he subscribed. He said he resented the fact that I was selling so soon after he joined. I decided to respond with a quick email noting that I was sorry he was leaving. But that I had a business to run and a family to feed. I put lots of hard work, time and money into creating such a good information spot – much of it free. And many people are eager to jump in deeper with the information I’ve put together. Charlie, I write this because of the disturbing trend online and off where people expect free stuff and resent being ask to pay – even after receiving good free stuff. I provide good free information to build relationships, to advertise, and because (like you) I really want to help people change their lives for the better. But to be resented for making a sales offer is outlandish. In many ways, the hard work of curating is losing the respect it should garner. While I understand that readers can make hurtful comments it is important to keep things in perspective. This was one reader. He could have been having a bad day or just be a person who likes to complain. Unless you see a trend in your own unsubscribe numbers or are getting other complaints I would not worry about it much. While I respect every readers’ opinion one reader unsubscribing does not a trend make. I also disagree a bit about curating losing respect or that there is a growing trend of freebie seekers. I have been online 12 years now and for each of those years there has been a group of people who will take and take and take and never buy. That is their right and it’s fine with me. But I don’t think this is a growing trend. Thank you for your comments. Always a pleasure to hear from you. In both of these, the authors very deliberately (and I believe very accurately) state that MOST PEOPLE operate with the best of intentions, albeit THEIR intentions. And it’s not only what they say, but often the WAY they come across that is the most hurtful. Great tips Russ. Thank you for sharing. I really can’t wait to get started.